"Holding him seemed to be the only way to truly make him happy. He needed to be loved." 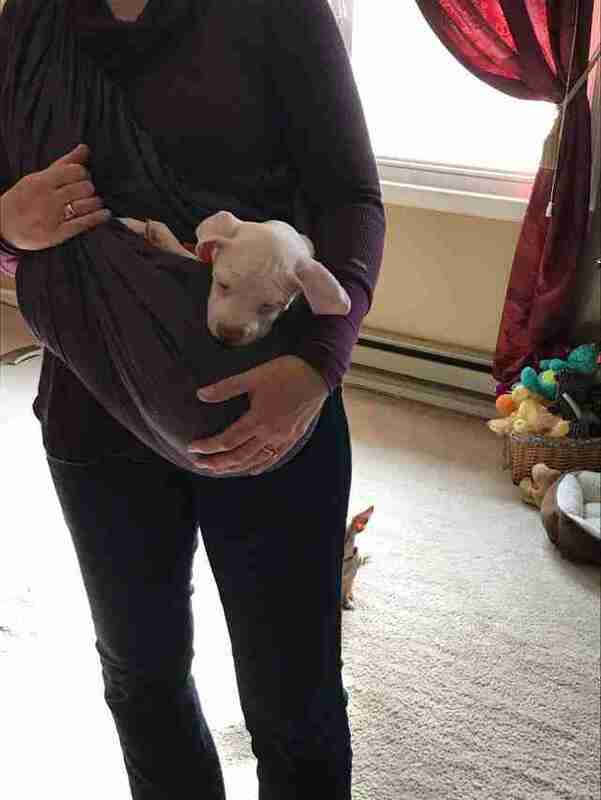 Rhett the puppy gets carried around in a soft purple baby sling, with a fleece blanket tucked inside to make him extra cozy. 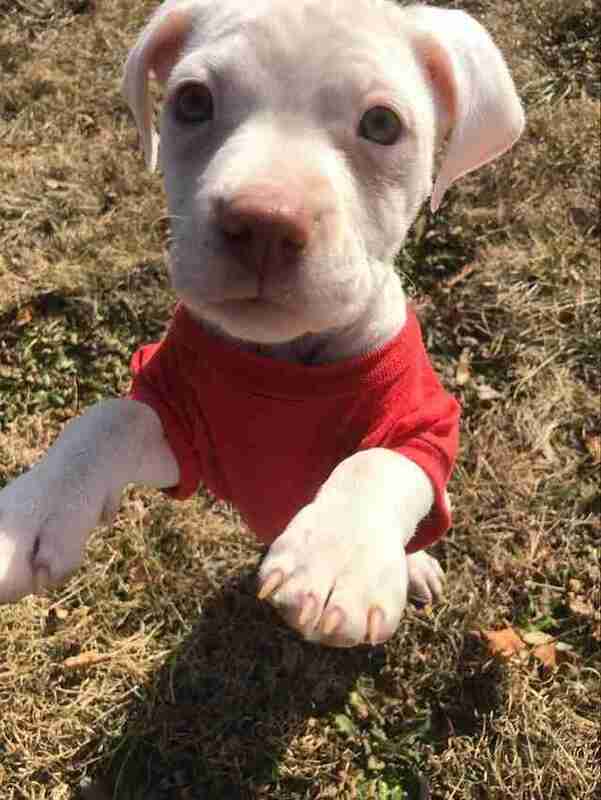 It's not because the pup has trouble walking. It's because Rhett hates to be alone. Rhett used to have two brothers, Owen and Junior, to keep him company. 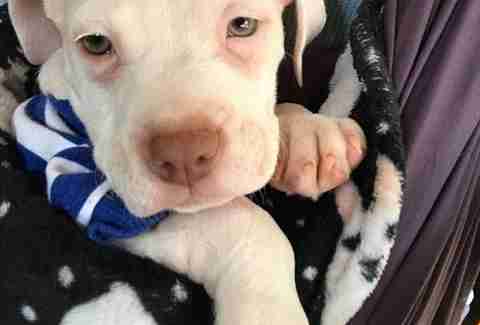 But shortly after they arrived at their foster home, Owen died; Junior then got so sick he had to go stay at the animal hospital. Rhett, who is about 2 months old, was desperately unhappy without the others around. 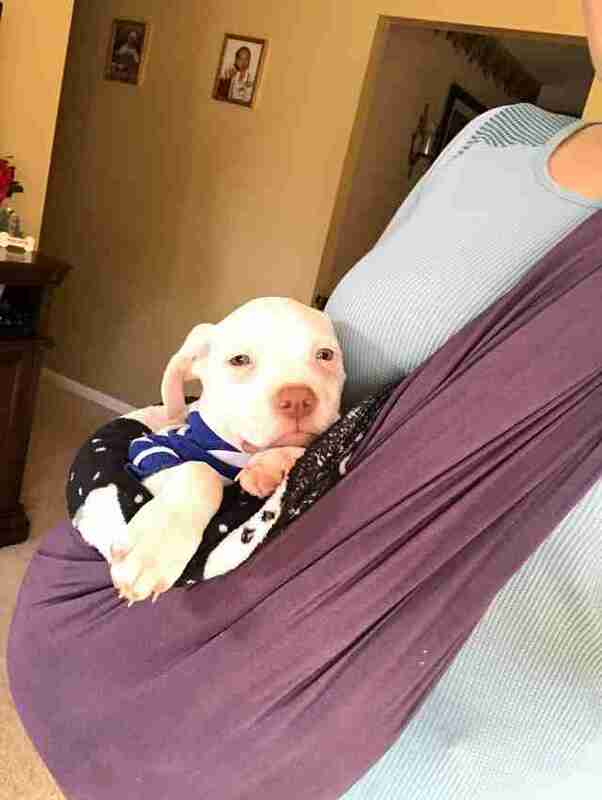 To make him feel better, Rhett's foster mom, Mariann Wright-Feliciano, decided to try carrying the little guy around in a sling made for human babies. "He was perfectly happy and quiet hanging out in it," Wright-Feliciano told The Dodo. "He howls and cries when he’s alone." Rhett, Owen and Junior were part of a litter of six who ended up in an Arkansas animal shelter with their mom. 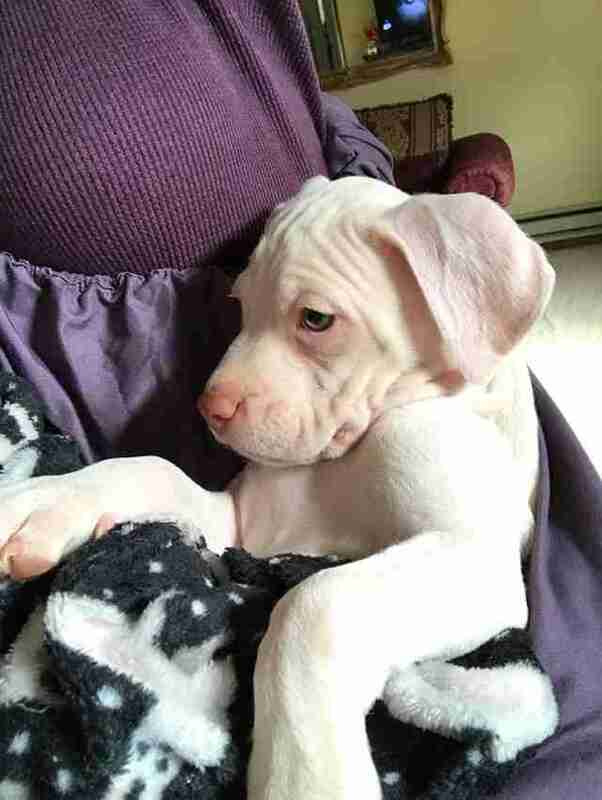 They were transferred to another rescue group before eventually coming north to New Jersey’s Don’t Bully Us Rescue. Since the pups were old enough and already weaned, their mom went into one foster home, and her six puppies were divided between two fosters. 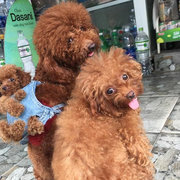 Rhett, Owen and Junior came to live with Wright-Feliciano, her husband and their two young sons about a week and a half ago. Unfortunately, the puppies weren’t in good shape, and Owen died just a few days after arriving. 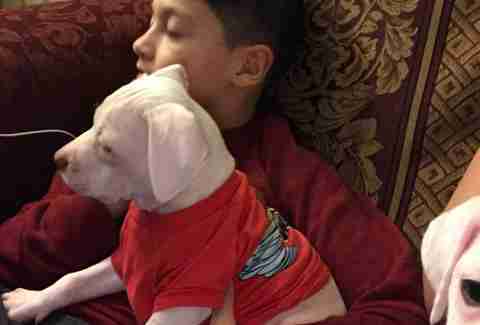 When Junior began showing signs of being sick soon after that, he was quickly dispatched to the veterinarian for treatment — and then went to stay in another foster home so he wouldn’t get Rhett sick. 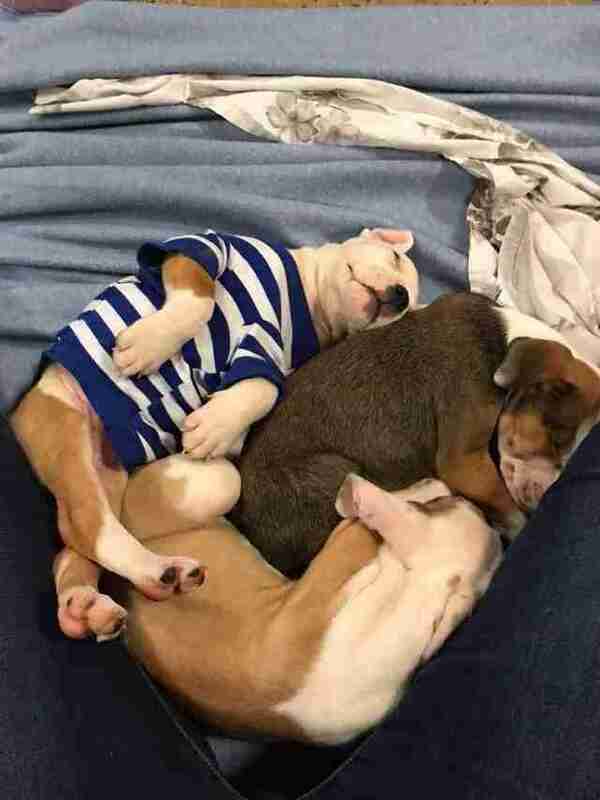 The veterinarians aren't yet sure what caused the puppies to fall ill.
"Possibly a viral infection. All the tests they took have came back negative. Blood work has [given] us no real answers except something is attacking their white blood cells," Wright-Feliciano said. It's left her "an absolute mess worried that Rhett could possibly get sick," she said. "My heart can’t take losing another one." While Wright-Feliciano was already inclined to spoil Rhett, she knew it was extra important to keep him happy after he lost his siblings. First, she tried to soothe him with a brand-new bed and some blankets. 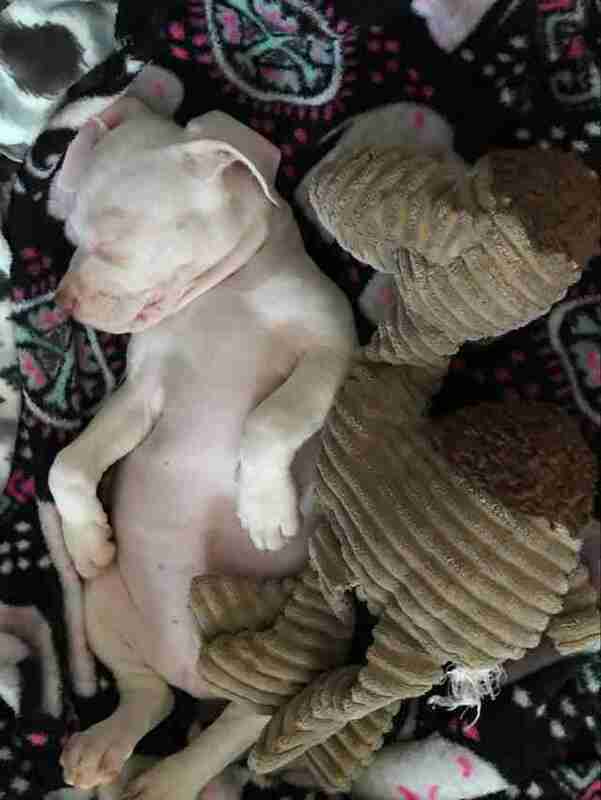 Then she gave him a special stuffed camel to snuggle. But nothing would work. 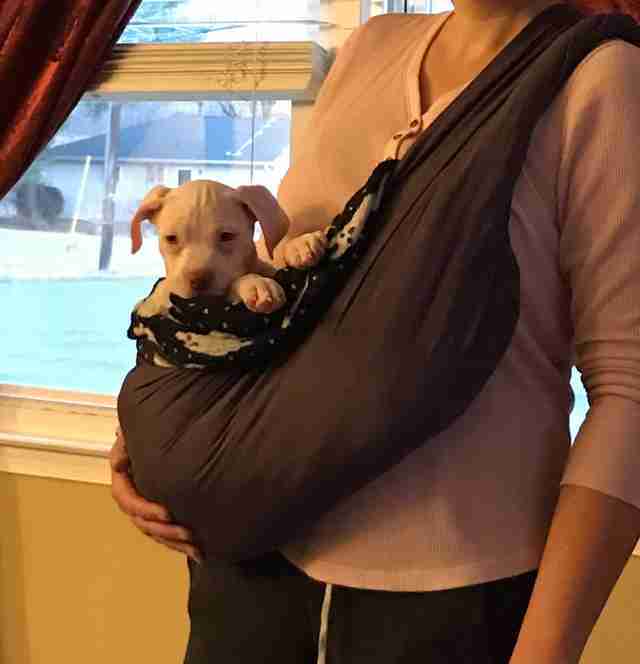 So finally, she tried the sling. "Holding him seemed to be the only way to truly make him happy,” Wright-Feliciano said. “He needed to be loved." While she can’t carry him around all the time — he needs to learn to be independent so he can be put up for adoption — it’s helping him get over his loneliness and the loss of his siblings so early in life. Even at his neediest, the little guy is satisfied with 10 or 15 minutes in his sling at a time. When he’s not in the sling, Wright-Feliciano said, he's busy running around the house, playing with toys "or looking for someone's shoes to walk away with." In another few weeks, when it's time for Rhett to go up for adoption, he will likely have outgrown his sling — both emotionally and physically. But Wright-Feliciano thinks Rhett will still be a dog who thrives on affection. She said that's why she asked that when he gets adopted, "he goes to a family that has another dog." The truth is that Wright-Feliciano treasures these moments with Rhett in his sling as much as he does — it’s helped her get over the loss of Owen, and Junior’s illness, as well. "Holding Rhett close is comforting," she said. "He’s going to be very hard to give up." 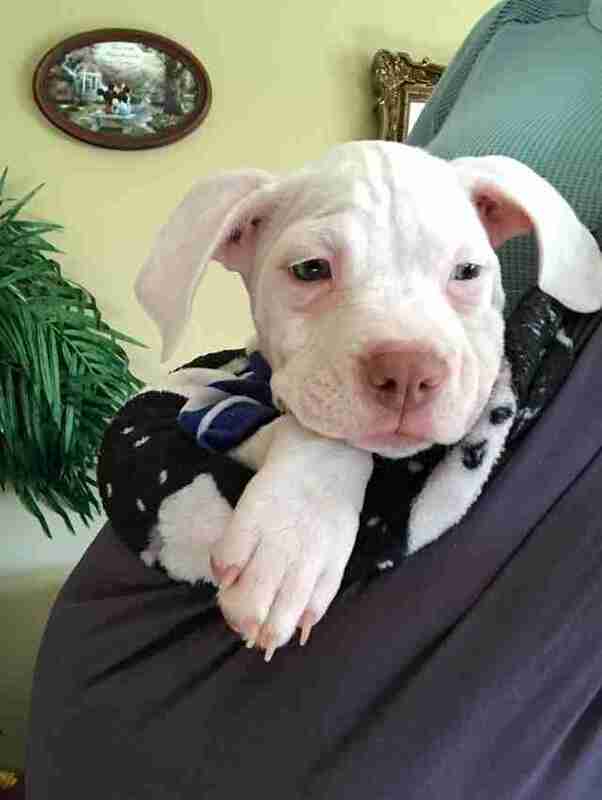 If you’re interested in adopting Rhett when he’s ready, you can reach out to Don't Bully Us Rescue. Interested in adopting another pet? Then meet Dodo Adoptbot, an interactive guide for new pet parents. Get started on Facebook Messenger or text HOME to 38349.